It's been nearly a year since bitcoin’s price peaked at almost $20,000 (all-time high). 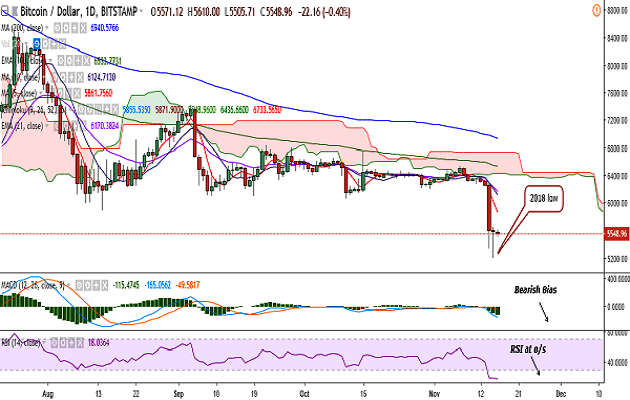 However, the story has taken a turn this year and bitcoin’s value plummeted to sub $6,000 in a matter of hours on November 14. That said, in the past year, the world also saw a tremendous growth in other cryptocurrencies and blockchain projects, with many believing that this is the time when developers and industry professionals are focusing on building lasting projects, attracting dedicated talent along the way. Oliver Carding, the CEO of cryptocurrency new site CoinJournal and blockchain toy startup Crypto Kaiju, said that the drop in crypto market cap cannot be attributed to one particular reason. “Also, the SEC has progressed in terms of its guidance for Token Sales. The fact that they declared Ether was not a security, but perhaps more importantly, a regulatory clarity, paints a clear picture of Ethereum's roadmap. The result? Ethereum 2.0, which was announced at Devcon4 earlier this year,” Karayaneva said, adding that cryptocurrency security exchanges got approvals and institutional investors accepted cryptocurrencies as the new asset class in the past year. According to David Wachsman, CEO & Founder of Wachsman, the primary benefit of the 2017 bull run has been the mass influx of talent and capital driven to the crypto and blockchain space as a consequence of its newfound popularity. “As a result, in 2018 we've seen the compression of the emerging tech hype cycle, an accelerated pathway towards robust base-layer and scalability protocols, and the establishment of more mature, revenue-generating businesses doubling down on blockchain in a multitude of markets,” he added. Eric Piscini is highly optimistic about the forthcoming year. He expects the total market cap will triple from the price it is today, the industry will become more mature, clearer regulatory frameworks in the crypto and blockchain industry around the world, and more diversity in this space. “What the industry has experienced in the past few years will serve as an example for investors and partners, which will help them to not make the same mistakes that have been made in the past,” he added. Carding believes that 2019 will be “a more stable year for cryptocurrencies” and expects some of the regulatory uncertainty to be resolved, which would open the door to companies who’ve been interested but reluctant to get involved with cryptocurrency and blockchain previously. “I expect that the major cryptocurrencies will make advancements in both on-chain and layer 2 scaling, improving their usefulness and reducing the need for altcoins, the number of which I expect to massively decline over the next 12 months. In terms of price, I’ve been in the space for over 5 years and couldn’t call it. I would hope that as use cases and capacity increases so too does adoption,” he added. Wachsman said the next year will see consumer-grade dApps deployed far beyond the traditional borders of the crypto ecosystem and mainstream financial services institutions going into production with well-tested blockchain infrastructure.